Video File Manager for TV Shows, It watches for new episodes of your favorite shows and when they are posted it does its magic. 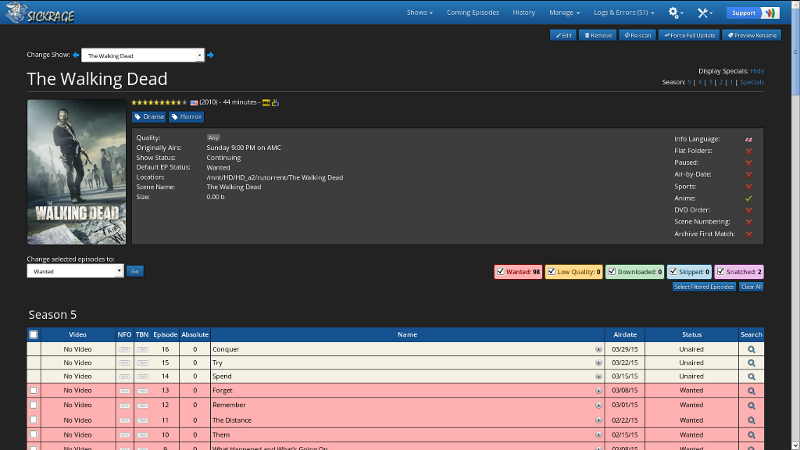 * Episode Status Manager now allows for mass failing seasons/episodes to force retrying. * DVD Order numbering for returning the results in DVD order instead of Air-By-Date order. * Improved Failed handling code for shows. * Importing of existing video files now allows you to choose which indexer you wish to have SickBeard search its show info from. * Your tvshow.nfo files are now tagged with a indexer key so that SickBeard can easily tell if the shows info comes from TheTVDB or TVRage. * Sports shows are now able to be searched for..
Download and install the SickRage Add-On. Click the link for the SickRage web interface and configure it. Wow. This is really awesome, something I've been waiting for!!! I guess you need a separate torrent client for this to work? Thanks so much for this package!!! How do I get the DNS-340L package to work? There is no Python 2.7 package for the DNS-340L. Hi, I am using a 320L, have Python and SickRage enabled but when I launch sickrage the page cannot be found and wont load. Only main diffrence I can see is that the signiture on the addons screen has an exclamation. Only "not worked" the cause is impossible to know. For more details, please. Any tips for me, please? There was a problem with openssl in the addon python. Fixed. You need to reinstall the addon python. I uninstalled both python and SickRage. Then, installed python 1.03, started it, reboot, installed SickRage 1.00, reboot, and started again. Still, cannot reach the page 192.168.1.3:8081 that is opened when I click on 'Launch interface'. Again, I'm on a 320-L and my ports are opened and forwarded. If I can supply more useful informations, please let me know. While I can't confirm or deny the problem. Asked a question to other users of the DNS-320L just SickRage, waiting for an answer. edited it myself and it appears to be working. Also, if you could make a CouchPotato addon that would be great. I tried making some addons a little while ago and didnt have much luck (incluiding SickRage, though I got it running, it didnt seem to connect to the internet itself). Also, if you could tell me how dou you sign the addons so it appears a green mark at the addons list? I did a simple addon to start the MySQL daemon and would like to sign it, maybe upload it.